With the unparalleled support of our dexterous professionals, we are offering high quality collection of Spare Wheel Winch. 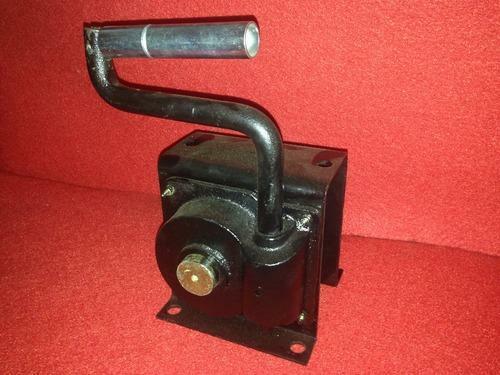 In tune with international quality standards, our provided Spare Wheel Winch is perfectly designed by utilizing the highly-tested materials and top-notch machinery. Our Offered product is immensely appreciated and demanded by our esteemed customers, owing to its quality attributes. Clients can purchased this product from us at pocket friendly prices. Jagdambay Engg. & Welding Works is ISO - TS 16949:2009 certified Company. To meet the growing demands of customers, We r capable to cast upto 300 kg one piece Casting and Forging. we are a Sole Proprietorship (Individual) firm engaged in manufacturing, trading, supplying and exporting a large range of Automotive Components, Brake Shoe, Sheet Metal Components, Bolts And Nuts, Trailer Parts, Towing Parts, Graded Casting, Scaffolding Components, Hand Tools and many more products. We are a firm which is a leading catalyst of precision and quality and provide engineered exemplary and perfection. Owing to the large industrial experience, we have now a massive renowned presence in the province over the competitors. With the decades of experience coupled with dedication and quality, our company has witnessed success to the credit. The products we supply are manufactured from superior quality material and as per the needs of the customers. Provided at reasonable prices, our products are known for their effective usage in various industries and have long lasting life. We manufacture our products under the brand name NDRA Gold.